Electric and hybrid vehicles are less than ideal for winter driving, but Chevrolet is making sure their 2016 Volt is more than capable of driving on snow and ice. 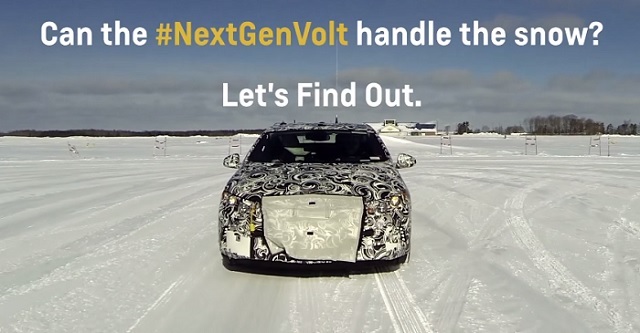 The next-generation extended range EV was caught cold weather testing in the Colorado Rockies a couple of months back, which may be when Chevy filmed this fun winter driving video for the yet-to-be-revealed Volt. The new Volt, set for an unveiling at the North American International Auto Show in Detroit next month, is powered by two small electric motors, with a 1.5-liter four-cylinder engine charging up its lithium-ion batteries. The car is expected to be lighter, quieter, more efficient and more refined than the outgoing model, with sharper more aggressive styling. The majority of Volt owners are in California, so they don’t need to worry too much about the winter driving capabilities of the new model. But for all those in Colorado, Michigan, New York and other snowy regions, this video is for you. Check it out below and make sure to check back to GM Authority next month for all the details on the new Volt. Previous story Community Question: Should Cadillac Offer The 2016 CTS-V With A Manual? I’d say, based on what I just saw that the 2016 Volt is “Cold and Calculating” on ICE and I want one. Big Deal! Less than a quarter inch of snow. Only the ice part was worthwhile. Based on the photo, is the wheel base, or car any larger then the GEN 1 Volt? 2 outside back seats in the rear. This tiny bit of added versatility makes a whole lot of difference in the buying decision for many – me included. Folks that got a sneak peek before the LA Auto Show say it has a center padded area suitable for a child seat. comparison, the Volt out-Priiuses Prius in many ways. Sorry you didn’t like my original comment, but I would like to see the new Volt manuever in 6 inches of snow, or more. How about 4 inches of heavy wet snow? I ask for this because this is what we drive in up here in northern Michigan. Lots of videos of Volts in 4 – 6 inches of snow on YT. Try searching.